Leer’s new Salvagnini FMS stars, left to right: a 12-shelf automated material-storage tower, combination shear/punch machine and CNC panel bender. Compared to the more conventional sheetmetal-fabrication process it replaced, the FMS has enabled an evolution from batch production to kitted, and greatly improved output while slashing labor content. The evolution from batch production to kits has dramatically improved manufacturing efficiency at Leer, Inc., an OEM manufacturer of ice merchandisers, as well as walk-in coolers. That lean conversion to kit production, occurring in 2015, hinged on the successful implementation of a sheetmetal production line that integrates a shear/punch combination machine with a CNC panel bender, all from Salvagnini. Installed at Leer’s 200,000-sq.-ft. plant in New Lisbon, WI, early in 2015, the line replaced a more conventional, and relatively inefficient, production process. “Previously, we ran coil stock through a cut-to-length line,” says manufacturing systems manager Dan Muth, “and then processed blanks through a shear, CNC turret press, press brakes, notchers and rollforming machines. That labor-intensive batch process required a lot of unproductive material handling. With the new Salvagnini flexible manufacturing system (FMS), the majority of our sheetmetal production is centralized and automated, delivering kits to downstream assembly operations much more efficiently. Muth calls the FMS a “monument running through the middle of the plant.” It measures 115 ft. long, and includes a Salvagnini S4 combination shear/punch and P4 panel bender, along with a 12-shelf material-storage tower that feeds raw material as blanks to the S4 on demand, one sheet at a time. After punching and shearing, a series of conveyors and a pair of cartesian robots help position the blanks as they travel to the panel bender. Material moves directly from the end of the FMS line in kits and into the Leer assembly area. 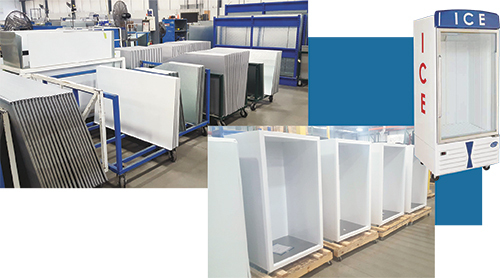 Here, cut, punched and formed panels (above) will be assembled into cabinets (right) for the company’s line of ice merchandisers. Leer’s new and improved sheetmetal-fabrication process begins with sheetmetal blanks of primarily 26- and 24-gauge material—galvanealled, galvanized, prepainted galvanized or embossed galvanized steel. Blank size ranges from 39 by 60 to 60 by 120 in. The plant processes some 4.25 million lb. of sheetmetal per year, most of which gets routed through the Salvagnini, and with most programs generating 90-percent or better sheet utilization. Noting how flimsy 26-gauge material can be, Muth credits Salvagnini engineers with helping to adapt the line to fit Leer’s application and ensure successful material handling through the FMS. That move from 50- to 60-in. material didn’t come easily, however. Muth notes that much time and effort was spent by both himself and Leer's product designers in redesigning the firm’s ice-merchandiser cabinets to match its new manufacturing capabilities—a true design-for-manufacturability accomplishment. The punch on the S4 works differently than on a conventional turret, explains Muth. All of the punch tools are live, and the machine can fire any tool at any time, even firing more than one punch at a time. Likewise, the P4 panel bender works completely differently than does a conventional press brake. It uses lateral bending force to form sheetmetal, generated by a pair of oscillating blades. The machine’s manipulator quickly and accurately moves the sheet, in order to position the side to be bent in front of the blades. A blankholder grips the material as the blades work their magic, making any number of bends up or down in rapid succession. Processing time is minimized since the blank only needs to be centered once, at the beginning of the process. This, according to Salvagnini, keeps cycle time, and more importantly, dimensional errors, to a minimum. Leer has enjoyed multiple days with more than 22 hr. of green-light time on the panel bender during a 24-hr. shift schedule, and an even higher run-time percentage on the shear/punch. “We typically see well over 1000 panels produced per day off of the panel bender,” Muth says. That productivity, he notes, largely is due to empowered operators who schedule the line to level-load the panel bander and shear/punch as best they can. To help, the FMS includes three buffer stations.